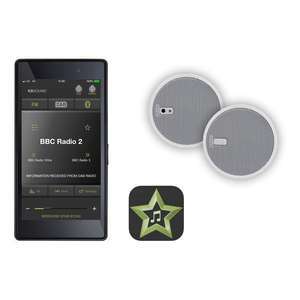 The KB Sound Select Star Remote Control is a replacement remote control intended for use with the KB Sound Select Star - it cannot be used with other KB Sound products. This KB Sound Select Star Remote Control is designed and purposed for using with the KB Sound Select Star in-ceiling audio system. This gives you the option, if you wish, to use a remote control if you do not wish to control the system solely with the free downloadable app. As standard, the KB Sound Select Star is sold without a remote control, so this is an additional extra. It is ideal for people who are used to, or simply prefer using a remote control device, or if you are conscious about using your mobile or tablet device to often or want a way to play audio without needing to switch between apps on your device. 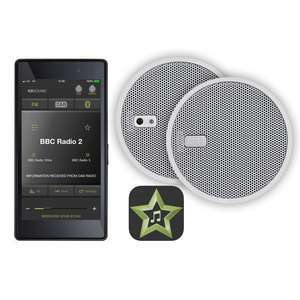 You can control switching between audio sources (radio to Bluetooth), control which stations, including presets stored, volume levels and many other features and functions too. Please note - this is NOT compatible with other KB Sound ranges - only with KB Sound Select Star. If you are still not entirely sure if your KB Sound iSelect system will be compatible with this remote, please contact us for more advice and guidance.